Guys I need some new ice pranks. I have pulled all the pranks that I can think of and now I am out. I have to bring new people along because I have done all the pranks I can think of to those who have came fishing. I have done the depth finder to a bobber line that one always is good for a laugh. I have done the sink a can of Bud. And last year one of my other buddies put a mouse trap w/ weights on the other guys line and it would have work but the minute he came back into the house and picked up the pole I burst out laughing and he knew that something had happend. So what are some other fun gags that you have pulled. We always take the oldest fish we had on the ice .Frozen stiff as a board, re hooked it and drop it back down the hole. send it to the bottom. as soon as they grab thier pole to start jigging FISH ON! Couple of years ago, a guy hit me in the head with a snowball. I told him that revenge is sweet. I ended up slipping a fathead into his pop when he wasn't looking. After a few gulps, he had all he could do to keep from that pop coming back up. There was about 8 of us out crusin around on the pontoon and one guy decides it's a good idea to troll out the side of the boat at 20 mph. Every time the driver made a right turn his line would come over the top of us so one time the driver turned and I grabbed his line and held it behind the wall behind me. Gave it a little tug and "OOOH, There's a fish!!" He sets the hook and I pulled again then gave him a little line and tugged a little more, gave him a little more line. He didn't notice the 3 of us in the back trying to hold in our laughter. I was going to let him in on it when another guy stands up and says "holy ****, that's a big one" and proceeds to help him land this monstrous fish. I played him for about 5 minutes before we couldn't hold it in anymore. There are two holes in our fish house that are about a foot apart and if I could get a hold of a line, I'm doin it this weekend. I don't how many times my buddies and I get each other by looking at each other's line when we are not paying attention and saying excitedly "HEY,YOUR BOBBERS UP"!!!! !.I know its childish but it gets them going. Well, there are a few of mine, but none that great. If your fishing a house with rattle reels and bunks you wait until someone falls asleep and them proceed in grabbing their rattle reel line, going over to your bunk, and then pulling the line so the guy wakes up, jumps up, and trys to figure out where the he** his line is in his sleepy dazed state. Or(this ones kind of dangerous), my nephews and I were out on a lake and the younger one(13) was getting really annoying so I set a 'trap' for him by filling a hole with slush, then making sure it was between him and I and telling him to come over to me. He ended up on his face with a very soaked leg, which was actually quite funny as "it was not my fault, you stepped in a hole!" Out fishing for spring crappies. 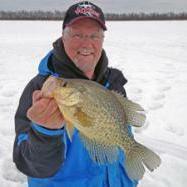 Drilled a hole about 1 foot into the ice, emptied my buddies minnows into it, put my pack over the "minnow hole", re-filled the minnow bucket with water, added 2 freshly caught crappies and a couple of the minnows, replaced the lid of the bucket, and sat back and waited. Buddy returns from a "nature call" to shore, drops his lines back down, and eventually decides to re-bait. "G&^ DA#@ IT!!!! he screams - "DID YOU PUT THOSE CRAPPIES IN THERE?" "I was trying to keep 'em alive" I replied. "THEY ATE ALMOST ALL MY F%$#& MINNOWS!" Eventually I fessed up, but it was sure as heck entertaining. When your partner isn't looking reel his line up to just a couple of feet under the hole, after he hasn't gotten a hit after awile he'll reel up his lure to check on it and thats when he will laugh his guts out. When you take out somebody thats never been out on the ice before,after your all set up and the ice starts groaning and popin', start freeking out like its something you've never heard before.Tell them to stay absolutely still and dont even say anything.After about 5 min. of holding in your laughter,it's time to tell them it's just makin' ice. I still get people to freek out even after they've been out a few times. One time on LOW we were tip-up fishing and our buddy was in the house not paying attention. So we saw this piece of drift wood or some kind of wood (about 30") that looked like a Northern Pike. It was almost a exact image of one but it was definitely a stick. So we attached that to his line and weighted the stick so it sank and the put it back into the hole. He goes running out to get it, gets down pull the tip up out and sets the hook. "I must be a good one", We even thought it fought pretty darn good for a piece of wood. Then he got it to the top of the hole, you........ LOL all laughter broke out. That one got mounted in a local bar until the owner ship got switched. I dont think he ever got over that one. LOL, That was the best I have seen so far. Where did you find those lottery tickets? That one sounds like the best of all!!! I have another, first the setup, I have a buddy that is a total slob drunk, he only drinks about 3 times a year, opening fishing,deer hunting, and our winter LOW trip, his "Goddess bon bon chomping wife" never lets him get away so this is a excuse to drink for him, it was getting old until I came up with this....I am a homebrewer so yes I like a beer now and then, anyway, I had the returnable cases of beer, this is what we use to bottle our homebrew in, I bought a case of Sharps and filled each empty of Bud I had and then I recapped them, He did not know! He did tell us that the beer tasted like S**t! He was not getting drunk and he was acting like it but then he caught on later, it was worth it. also, a follow up to my last post, I found both the fake lotto tickets and morning breeze on the same HSOforum. It looks like I will be placing an order soon. You don't need fake lottery tickets. Just do what I did to my wife a few years ago on April Fools Day. I bought a new powerball ticket with the previous winning numbers on it. I then set it on the kitchen table along with a newspaper that had the winning numbers in it. I made busy around the house until my wife finally decided to check that Powerball ticket against the numbers in the paper. She just about made a new doorway in the house she was so excited and jumping up and down. Once I calmed her down, I told her to double check the date on the ticket. It was kind of a cruel joke, but she expected it from me. Proceed with caution. This may cause premature heart failure. Here is a good one if you are in a permanent shack, get a bottle of "Morning Breeze" you can get it online at some of these jokeplaces that sell the sqirting flowers ect, it is a stink perfume.. very nasty smell.. like bad gas, you get the drift, anyway tell your buddy that the doctor says you cannot have any beer, junkfood, or whatever you happen to be eating or drinking. spread a few drops and you'll see your buddy running for the door, it also works on those fishing trips in the cabin when you have "friends" who like to rip them, now your fighting fire with fire! Works best inside of trucks and cars on those long hauls northward...it could be -20 and they will have the windows down. Don't ever tell, I've been doing it for years and it still works. I once found a "honey hole" on a slough that ran through a golf course. It was a small area. Once word got out, I was darn near kicked out of my own spot! I went to Florida to visit a friend. While down there I caught several species of ocean fish which I brought back frozen whole. Jack crevalle, snapper, drum, and something that looked like an angel fish. I went to my spot close to sundown armed with my frozen ocean fish(all trash fish if your wondering) to find I could not even fish due to the amount of people. Since they were fishing panfish, it was a day bite only. I told them I was setting up to night fish for some "unusual" fish my friend reported catching. They were watching me as I commenced to cutting up some cut bait, opened a can of corn, and layed my tip-ups on the tailgate of my truck. When everyone left, I layed the fish around several holes and left. The next morning I showed up to quite the buzz of excitement! Fish ID books, theorys of paper mill "mutant" fish...You name it. They asked me if I caught them, I said "Well, I hate to give away my secrets"... Then left. That afternoon I returned before dark. Guess what? Guys were setting up with cut bait and corn on tip ups! Fishing locally can be a tough thing where I live in WI. When I return from MN. with a pail full of slabs from Red, jumbos from winni, and some walleye thrown in from wherever, I stop by one of the two local "fish villages". I pull into the main crowd, open my tailgate, and "accidentaly" dump my pail of fish. Believe me, we dont catch slabs or jumbos like those on these lakes. The looks on thier faces is priceless! When they ask where, I tell them over by xxxxxx. Then I go over to xxxxx, and do the same. Soon both groups are switching spots, driveing past eachother to the new "hotspot". PS: Most of the people on these very crowded spots are A-holes, so it doesn't bother me that much. Oh, ice pranks. Heres a couple. You know how the bottom of your pants freeze solid from drilling holes? Bring an extra pair of old boots and snow pants. Let them freeze together then slide them off. The boots usually stay frozen to the pants. Then bury and mound snow on them so just parts of the boots and pants are exposed. Toss some beer cans around and walla! It works great next to heavily travelled roads!..........Maybe a rubber snake on your friends line? Or hook a maniquin(sp?) arm on your buddys line when he isn't looking! Or maybe bury the maniquin's arm in the snow next to the frozen boots! Or catch your buddy's line with a jigging rap or something similar. Pull it through your hole and hook it to his glove or anything else HE owns. Have the bobber set below the surface. When he sets the hook...Bye bye glove! Maybe hook it to a can of fluid above his head!..Alright, I had enough now. PS: Does anyone want to go fishing with me??? One to try when you get "vistors" to your shack,ie your buddys wife or whoeve,is to offer them a tour of the lake on an avaible snowmobile or atv' while there gone two other people take her car and drive across the lake or somewhere out the way where they won't see it. When they get back play dumgb claiming you never heard their car "get stolen" and watch them panick! It worked well a few years back for us. P.S. we got the same girl who was 18 at the time by taking an empty case of beer and putting it in the back of her car while her dad watched. When she came out her dad "found" the case in the carhe would not let up in her until we all started laughing. another good one is take stink bomg you buy in the glass bottles and using black tape tape to the break pedal of the of their truck, first time on the breaks and it's open windows all the way home. A couple years ago I was taking a college buddy of mine out for his first ice fishing experience. The entire way to the lake he wondered how much ice there was and how you know and what if this what what about that. It was mid-January and we were driving out on about 20 inches, so there wasn't going to be a problem. When we got to the landing, I got out and walked to the back of the truck, telling my friend I had to grab something. I climbed back into the cab wearing a life jacket and a pair of floaties. I handed him a life jacket and said, here you go ... put this on just in case. He jumped out of the truck and said, no thanks, you're crazy, I'll just follow behind the truck and walk. I laughed so hard ... even harder when I couldn't take it anymore and stopped to pick him up about 300 yard out onto the lake.